Little tikes will love to explore this brand new fun-filled maze. Just the right size for the youngest participants, Mom & Dad can even come too! What do we have for the 4 and under crowd you ask? How about a 22'x22' inflated pre-school activity area that is under the \Big Top\. An elephant slide, a ball pond, four individual moonbounces and games galore are guaranteed to provide safe fun for your youngest of party guests. The always popular football toss has been updated into an inflatable game that makes this classic game new again. Ages 6 through adult. 78' of pure fun with 7 unique and very challenging obstacles makes Toxic Drop the most difficult obstacle course around. Don't be fooled by its super cool looks, this thing will throw you down and eat you up, no mercy! Designed for the guests 48'' and taller because, seriously it's tough. All Aboard for Casey! Eighteen children and adults can climb aboard for a ride to anywhere! ANYWHERE because Casey has no tracks! The only restriction is the train must be run outdoors. A fun ride for any picnic or company party, school or church event. Even use it as transportation from your parking lot to your store! Pirate life can be tough, but not as tough as battling your way through winding obstacles and climbing over a giant treasure chest and sliding your way out before the pirates discover you've stolen their precious treasure. Treasures of the Caribbean is a beautifully crafted obstacle course and is sure to please all pirates and non pirates alike. Designed for guests 42' and taller. A 4-way rope make this the perfect team building activity. Sure to be a hit at your event. A carnival ride that spins around, while each tub spins in a different direction. The Turbo Tubs holds 24 children or 12 adult riders at a time. The \Tubs Of Fun\ style ride is a true Midway classic. We finally found it, the cutest slide in the world! The Turtle Time Slide is a 15' slide designed for ages 12 and under and is sure to be the talk of your event. It will be hard for the kids to resist the chance to slide down the brightest turtle around! walking on the moon! Guaranteed to keep the kids entertained for hours. With the aid of bungee cords and a trampoline the V4 Ultimate Bungee allows you to launch yourself over 25’ in the air. If you’re brave enough, attempt a flip and the really brave can attempt the triple flip. That’s right, you can get enough air to try not one, not only two, but three flips in the air. Four guests at a time will enjoy this super sized, high velocity activity brought to your next event. For guests from 40 – 200 pounds. 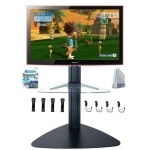 Our version of modern gaming entertainment includes 2 separate gaming units, 2 large LCD monitors and 4 controllers. A wide variety of games are offered to customize the units to your audience. A complete professional volley ball set that includes adjustable poles, net, volley ball, stakes and rope boundaries. Toss the ball and try to guess what color the ball will come to rest on. Available as a mega game only. You have seen it on the midway and now it is in our inventory! As the twisted wire spins, you thread the metal hoop to the bottom of the game, hit the wire and you are waiting in line for another turn! The new Wacky Wire is skill adjustable for every event. Ages 8 through adult. Blast your Buddy or Douse your Spouse with our all new Water Wars. An absolute must for your summer event, Water Wars is as much fun to watch as it is to play. All ages enjoy playing one of the most innovative and fun summer games we have seen in a long time and we can't wait to add your Guests to the list of players. Nothing says “Crazy Fun” like trying to escape over the 4 giant inflatable balls from one end to the other. Direct from the famous Wipeout show, our inflatable will not only test your skill level, but your Fun Factor! Don’t worry if you fall, you will land on our patented Zero Shock air pad for a soft and comfy crash. No matter the sport, World Sports Games has the game kids want to play! Choices are: football, soccer, basketball, baseball, dart/Frisbee, all under one inflatable play structure. Encourage team spirit and friendly competition as everyone plays their favorite game simultaneously. Add prizes to create your very own \carnival of sports\. Just when we were thinking there was nothing new in the inflatable department along came the Wrecking Ball. Four people stand on their pedestal and try to avoid the giant wrecking ball as it comes their way. It is much harder than it looks and you and your guests will have a blast giving this brand new item a try. Get ready to create havoc as you climb aboard our newest carnival ride for guests 42\ and taller. Up to 12 guests spin and swing wildely up and down riding inside the Wrecking Ball, nothing but screams and fun!